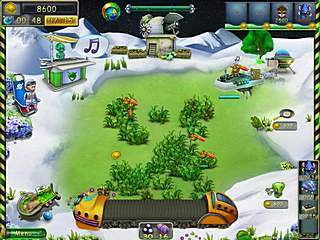 Terrafarmers is a new game from Alawar Entertainment. We can compare this game with Farm Frenzy. These two games are similar in a lot of ways. Everything is familiar to you and you know what to do. To refresh the popular time management series the editor offers you to go to space. Now well known genre is full of new twists, new ideas and fresh sci-fi settings to give you new experience and enjoyment. Once you come across a lost human baby. Kid needs to be returned to Earth. And that's what you are to do since this moment. You start this game as a captain of a terraforming team.You travel from planet to planet and make them green enough to start life. Make new dishes and upgrade equipment. At first sight everything is easy and familiar. You move from level to level according to the large world map. But once you come across a lost human baby. Kid needs to be returned to Earth. And that is what you are to do since this moment. Your main goal in almost every stage is to terraform planet, and you can accomplish it by planting enough greenery until a meter reaches 100 percent. Besides that in each level you have to earn money, collect a certain amount of a specific items and produce goods. For these purposes you have variety of useful machines. One is for producing plant life which you can place on the empty field. And if you have enough plants alien life will start to develop. Another machines can be used for various things, like for evolving aliens into new forms and for producing different items. For earning money you have a spaceship that can fly off and sell all or a part of the goods you produce. There is also a new market feature that let you sell goods to wandering aliens and you can earn more money there, but it takes longer. 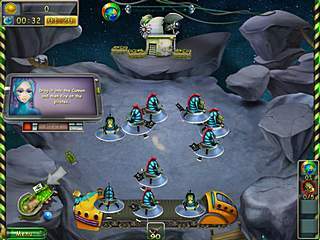 In Terrafarmersyou will deal with space pirates. They will fly onto your planet from time to time. And again you are able to earn some money by shooting and hitting them. Another nice machine called cannon can be used for it, which can be upgraded as well as most of machinery. Here you can use your DNA points, you can earn them after completing levels. This DNA credits also will be necessary to unlock a few optional areas. So if you desire to see more you need to save up. You will meet strange but still funny and cute creatures there. They appear not to scare you, I think, just to amuse you, to add a variety to your experience and make you feel difference. As we are on the unknown planet! To sum up it is really cool game, something new and interesting with great graphics and not boring music. The hour will just fly by with these new gameplay elements. I think a lot of people will enjoy playing Terrafarmers. This is Terrafarmers review. Download this game here.